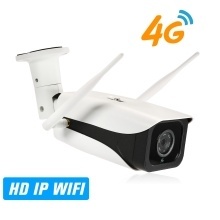 *HD Megapixels 3G/4G IP Camera, 720P high definition video recording. *With IR-CUT double filter, auto switch between day/night, restoring clear image and true color both day and night, 4pcs array IR leds, night visibility up to 40m. *Built-in 32G TF Card, support 1080P video recording 6 days recording. Support Max. 128G TF card. *With two enhanced WiFi antennas, providing strong and stable signal. *IP66 Waterproof lighting protection, no worry about rain and wind. *Plug and play, no need complex installation.